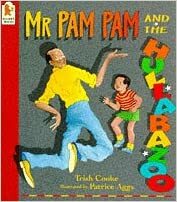 Published by Candlewick Press in 1994, Mr. Pam Pam and the Hullabazoo is written by Trish Cooke and illustrated by Patrice Aggs. The story is told in the first-person from the point of view of a child who Mr. Pam Pam visits with his baby. Mr. Pam Pam is a long limbed goofy Black man who garners giggles from the narrator and and the narrator’s mom with exaggerated movements and silly jokes. He has a running joke with the narrator involving a character named Hullabazoo. The young boy isn’t sure if Hullabazoo is real until one day when he shows up at the child’s house dressed clownishly. The only thing that marks the text as queer is Mr. Pam Pam and Hullabazoo walking down the street together after spending time with the narrator. Hullabazoo’s arm is on Mr. Pam Pam’s shoulder as he pushes the stroller with (presumably) their baby in it. The book certainly invites an aha moment – yes! – Hullabazoo is real and he is Mr. Pam Pam’s man. However, this reading might need to be prompted by an adult because the text’s subtlety. This is a fun, very goofy story that will invite lots of giggles from very young readers. The queer subtext is so subtle I won’t suggest it as a must-have for LGBTQ collections, but it is quite easy and inexpensive to purchase used, and it’s a good read!